Many students, parents, and educators have concerns about how to keep their campuses safe. 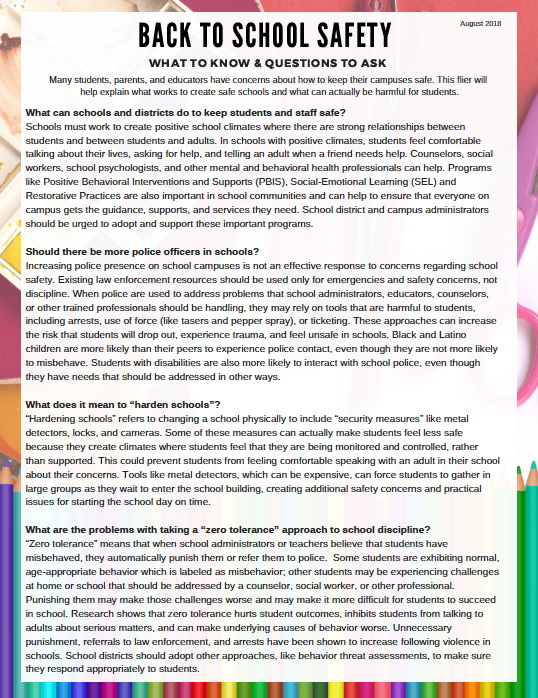 This flier will help explain what works to create safe schools and what can actually be harmful for students. Muchos estudiantes, padres y educadores tienen dudas sobre cómo mantener la seguridad de su campus. 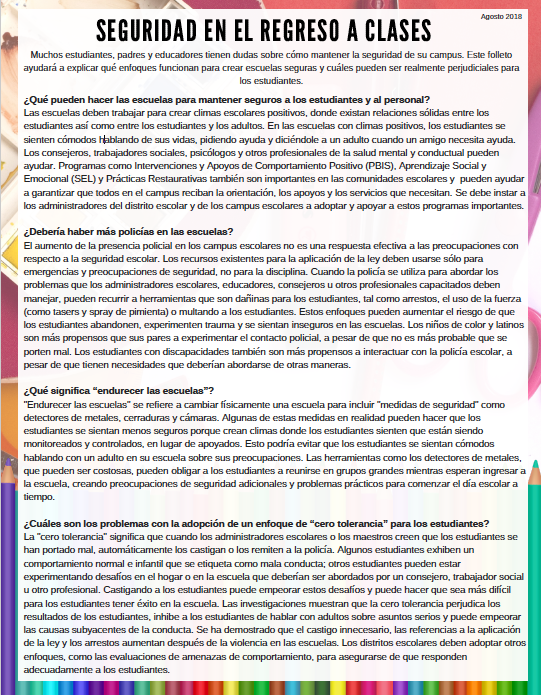 Este folleto ayudará a explicar qué enfoques funcionan para crear escuelas seguras y cuáles pueden ser realmente perjudiciales para los estudiantes. 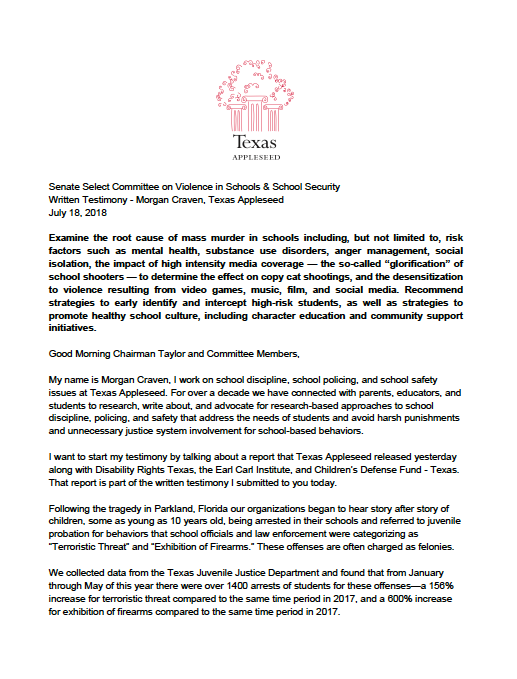 Senate Select Committee on Violence in Schools & School Security. Written Testimony of Morgan Craven, Texas Appleseed. EXCERPT: Following the tragedy in Parkland, Florida our organizations began to hear story after story of children, some as young as 10 years old, being arrested in their schools and referred to juvenile probation for behaviors that school officials and law enforcement were categorizing as “Terroristic Threat” and “Exhibition of Firearms.” ... In many of the cases we were hearing about there was no substantive threat made. Sometimes kids were expressing emotions like anger, fear, or frustration in improper, but age-appropriate, ways or ways that are a manifestation of a disability. Sometimes kids were just saying insensitive things or make terrible jokes. 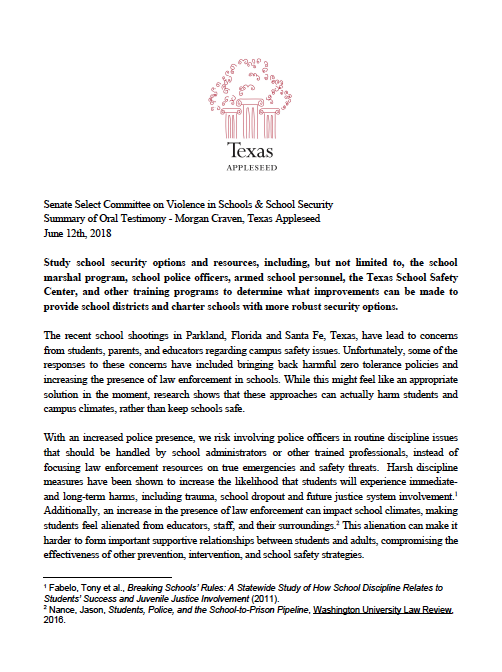 Senate Select Committee on Violence in Schools & School Security. Summary of Oral Testimony of Morgan Craven, Texas Appleseed. 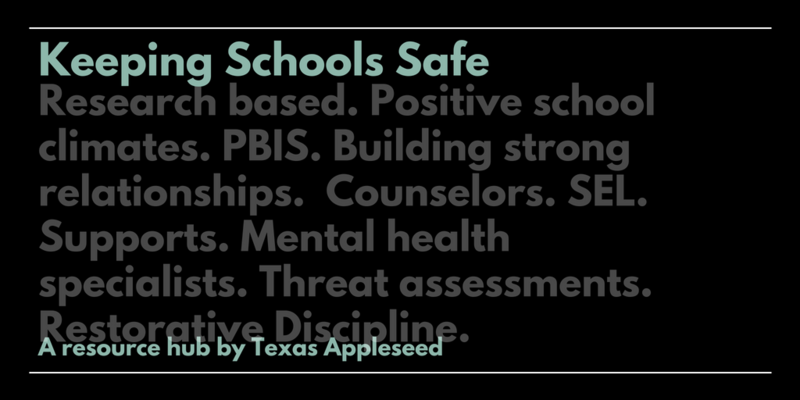 OPENING EXCERPT: The recent school shootings in Parkland, Florida and Santa Fe, Texas, have lead to concerns from students, parents, and educators regarding campus safety issues. Unfortunately, some of the responses to these concerns have included bringing back harmful zero tolerance policies and increasing the presence of law enforcement in schools. While this might feel like an appropriate solution in the moment, research shows that these approaches can actually harm students and campus climates, rather than keep schools safe.